The Okanagan has some of the best ingredients and when you pair them with ingredients from other parts of Canada, you can get results that showcase the absolute best of our country. Here’s a Canadian comfort food recipe that features both local and national ingredients just in time for cooler weather. Stop in at the Kelowna Indoor Winter Farmers Market or Quality Greens where you can find some of the items you&apos;ll need for this recipe as well as other delicious ingredients from the local vendors and suppliers. CORNBREAD (casserole - part 1). Heat buttermilk, butter, and sugar until butter is melted, stir in baking soda and cornmeal, than add the eggs. Remove from heat and stir until smooth. Pour batter into a baking pan lined with parchment paper. Cover and bake for 25 min at 375°. Remove cover and bake for another 25 min. If you don’t have a convection oven bake for 40 min than uncovered for 40 min. Try not to eat all the corn bread! Looking for a shortcut? You could buy pre-made bisque but homemade is much better and worth the effort. 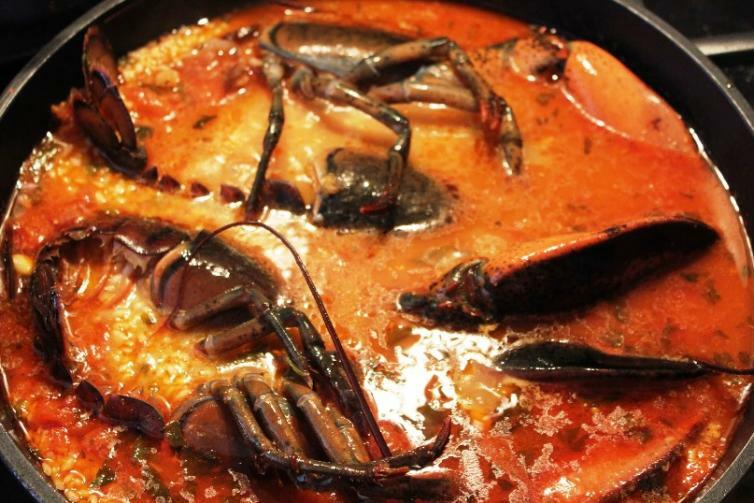 For the homemade bisque you will need to purchase some lobster bodies. I recommend stopping by Guisachan Village Centre where you can pick up fresh produce, breads, and deli products. This quaint shopping area in the lower Mission area of Kelowna is also where you&apos;ll find Codfathers Seafood Market - one of the best places in the Okanagan Valley for oceanwise, ethical, and fresh seafood (check out their newly opened restaurant too). For the recipe, you will need 4 full lobsters. Roast them in the oven with your windows open (trust me). Roast at 400° for about 45 min. With 15 min left add 2 cups onions and 1 cup carrots and 1 cup celery to the roasting pan. In a large stock pot add the shells and vegetables alongside 1 litre chicken stock and 1 litre water. Bring to a boil. Once boiling, reduce heat and simmer for 1 hour. Carefully strain contents of pot so that you keep the broth. Discard shells. In a sauce pan on medium heat, melt the butter and add in everything but the cream, rice, tomato paste, and broth. Sauté for 8 to 10 min then add in pre-cooked rice, tomato paste, and broth. Simmer for an hour or until reduced by half. Transfer into blender and blend until smooth. Return to pot. Bisque should be thick enough to lightly coat the back of a spoon. If it is too thin, simmer to further reduce and thicken. If it is too thick, add some water or chicken stock. When you have your consistency correct, add the cream for richness. Finally taste and add salt and pepper as needed. Cut cornbread and brioche buns into bite size pieces. Place in mixing bowl add in lobster and cheese. At this point the recipe is akin to making stuffing. Slowly add in the bisque until cornbread and brioche bread is evenly coated and moist. Grease a baking pan and bake for 40 min to an hour at 375° until top is nice and crispy. Let cool and enjoy! While this recipe may seem daunting and complex, it is easily accomplished with careful planning. A helping hand or two will make the process easier and the end result is sure to please! Chef Jeremy Luypen is an award-winning chef, with brilliant creative skills, extensive food & beverage experience and a reputation as one of the top chefs in the Okanagan. 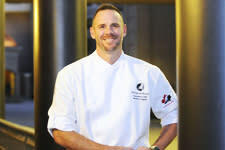 He is Executive Chef at Predator Ridge Resort, current president of the Okanagan Chefs Association, and an instructor in the Okanagan College&apos;s Culinary Arts Program. Jeremy&apos;s menus focus on Farm to Table with ingredients that feature local farmers, orchards, meats, and sustainable BC seafood.